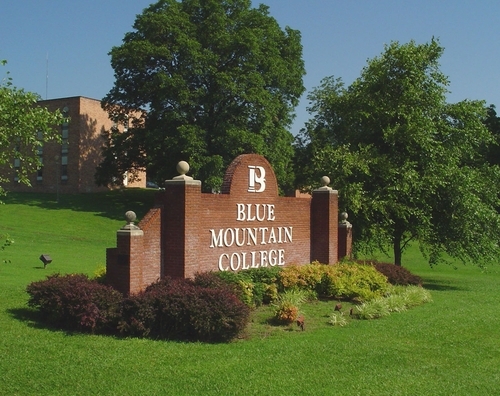 BLUE MOUNTAIN COLLEGE was founded in 1873 by Mark Perrin Lowrey. BMC is located in the rolling hills of North Mississippi in the town of Blue Mountain, which derives its name from the “bluish” tint of the hills. The campus consists of 44 acres and 14 main campus buildings. As a Christian liberal arts college and affiliated since 1920 with the Mississippi Baptist Convention, the College recruits undergraduate and graduate students who are committed to scholarship, servant leadership, and service.The student-centered campus exhibits a climate of personal attention, respect, inclusion, and high expectations in all modes of delivery.BMC offers a strong tradition of student-led organizations and activities. The Office of Student Activities serves to coordinate the many organizations and activities that take place daily on the campus including eight national honor societies. The purpose of Blue Mountain College is to prepare students for graduate school, the job market, and a more fulfilled life. Providing a sound general education foundation, the College offers an undergraduate liberal arts curriculum, pre-professional and professional programs, and opportunities for graduate study in selected fields. The College is committed to offering programs which provide opportunities for service. Blue Mountain College has a student/faculty ratio of 11:1 and offers courses of study leading to three undergraduate degrees: Bachelor of Arts (B.A. ), Bachelor of Science (B.S. ), and Bachelor of Science in Education (B.S. in Ed.). Location: BMC is located in the rolling hills of North Mississippi in the town of Blue Mountain, which derives its name from the "bluish" tint of the hills. Campus: The campus consists of 44 acres and 14 main campus buildings. Enrollment: Enrollment for the Fall 2016 year was 571. The student population is 57 percent female and 43 percent male. Fifty-seven percent are residential students and 43 percent commute to campus. Graduate Programs: Blue Mountain College offers three Master of Education degrees: Elementary Education, Literacy/Reading K-12, and Secondary Education – Biology. Activies/Clubs: BMC offers a strong tradition of student-led organizations and activities. The Office of Student Activities serves to coordinate the many organizations and activities that take place daily on the campus. Athletics: BMC is a member of the National Association of Intercollegiate Athletics and the Southern States Athletic Conference. Click here to browse academic programs at Blue Mountain College. CLICK HERE to visit Blue Mountain College's Website for International Students.